As a staunch Royalist, I wish Prince William and his new Bride Kate, a long and prosperous marriage. Not only is it something of a Royal occasion but it is also an opportunity to wave the flag and have something for everyone to talk about. Our Royal Family is something that, as a serviceman, I hold very dear and I would hate for England to become a republic. ...today I have had the opportunity to put some model kits together...so it is an added bonus. See you through the streamers, bunting and waving Union flags! It is Easter and as I tuck into my highly commercialised chocolate egg, I can only hope that those millions of Christians all around the world are attending their places of worship on what, to them, is the most holy event of the year (some would say the miracle of the resurrection is of more significance than the birth of Christ...but without one, you wouldn't have the other) with a bit more faith than I have. It is the medic unit with various doctors, scanners and stretcher bearers. I could have taken the sci-fi approach to the stretcher and have it either hover about or be carried by robots but I really wanted it to be a 'back-to-basics' sort of thing...so I kept the manually carried stretcher. Now all I have to finish are the other 10 mechs and the army will be finished...until I start to think about transports, that is! 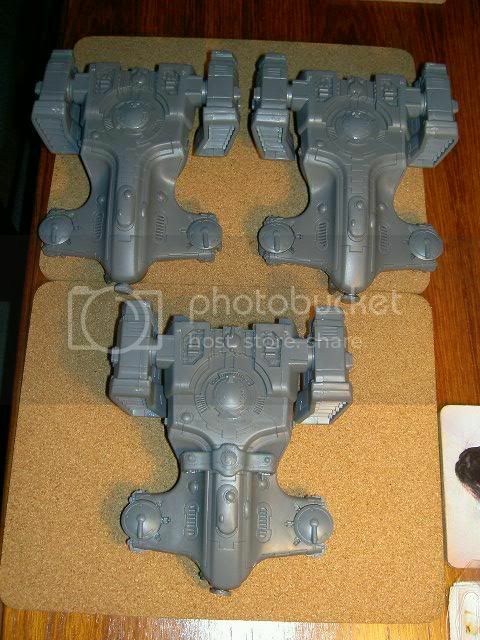 In the meantime, I will be looking to start my Urban Army once the mechs are done...so the transports can wait. By the way, I have just updated my Grymn Blog with a few items that may be of interest...so you may want to pop over and have a look. See you over the crowd of eager children hunting for eggs! Welcome to the newest traveller to Inso's World, Dave Adams! Hope you enjoy your stay and find at least a small amount of something to inspire you. I have a bit of a confession...I haven't touched any hobby stuff since Salute. I think it is a bit of a case of saturation from all the new toys and tiredness. The Grymn medics are still waiting for some work but they may take a back seat to building the last 5 mecha. Once they are all built, all of the pilots can be sculpted along with the bits and pieces on the medics. I am trying to decide where to put my new robots (The Protolene robots from Critical Mass Games)...do they go with the Grymn? Do they go with the Necrons? Do they join the Starship Crew? Or do they become enemies for the Grymn? I have had a chance to look through the little box of 15mm stuff and to say that I have been well and truly spoilt is an understatement... aerial drones... hover vehicles... bikes... tanks... APCs... artillery... and more besides! I am formulating plans and conversions as I type. So much to think about...and don't get me started on the motorcycle I have sat in the garden slowly returning to mother earth...I must get her back on the road. See you through a hay-fever sufferers eyes. I returned home from Salute2011 at about 21:00hrs last night after a long day in London. I will apologise now for having no photos...I really didn't have the time or enthusiasm for taking any (even though I had my camera with me). This year I managed to get lucky and jump on all the right trains, have no travel problems and arrive at the venue for about 09:15hrs. The Excel centre in London Docklands was exactly as it was last year, with plenty of places to buy food/drink and plenty of places to withdraw cash if you needed to. The venue for Salute had moved up a couple of halls but it was just as large as last year so there was enough space for everyone to potter about. The queues were enormous and there seemed to be a lot more people at the show than last year. There were the usual mix of Storm-Troopers milling around and plenty of people giving out flyers and information. The Salute goody bag was pretty cool...Kaiser Rushforth had put a storage carrier in there and the Salute miniature was very nice...there was also a tiny little metal car...and the program with a bunch of flyers. Once in the venue, I spent most of the day helping out at the Hasslefree Miniatures stand and chatting to so many people that I couldn't possibly remember everyone. So everyone who made the time to come and say hello, thank you! You were well met! Just from the volume of people traversing the store, I was kept busy finding specific miniatures and helping people to spend money (as were everyone else!). At about 14:00hrs I went for a much needed coffee, pastrami sandwich and bottle of water before having a quick wander around the stands. This year (again! ), I didn't really pay too much attention to all of the game boards but managed to remember to stop at Brandlin's FANTASTIC Twilight table (a work of art to be sure) and miss out on the Frother's Cthueldo table (which won a prize on the day...WELL DONE FU-UK!). Gwartist...Thank you for your more than generous gift of a small box bulging at the seams with 15mm goodness. You sir, are a true gent and were very well met on the day. I still owe you a coffee and cake (and an ear-bending for camo-painting tips!). Vermis...I always enjoy looking at people's sculpting and some of the gems that were emerging from the little tupperware box were a joy to behold. I look forward to seeing finished sculpts very soon...and the Halfling was unbelievably detailed for something so tiny! Every one on the Hasslefree stand...Neil, Sarah, Mr and Mrs Gomez, Gi6ers, Sally and Kev, it was an absolute pleasure spending the day with you all. Brandlin...The table looked outstanding and I hope that the level of interest in your laser etched products, expands exponentially. I know it was a tough day but the table was worth the trouble. Carcharoth...as enthusiastic and friendly as ever. All those who took the time to come and say hello...I may not have remembered names but the faces, I recalled! Thank you for coming to say hello...it is people like yourselves that make Salute such a great day for me. So...what the hell did I come home with? Today is a day of recuperation and reflection with maybe a small amount of looking at and sorting out the haul. All I can add to this rambling post is to say that I am really looking forward to next year! See you across the sea of people! I have three bases with some medics on the table, ready to have their conversion finished and that, as they say, will be the end of all the troops for the army. ...just thought I'd share :). See you at the end! Today is the day before SALUTE. I have my ticket for the show, my ticket for the train, a wallet bulging with pennies and a long suffering wife who will be dropping me off at the railway station nice and early in the morning. This year, like last year, I will be helping out on the Hasslefree Miniatures stand which can be found by walking through the entrance hall doors, turning left and walking until you bump into the dividing wall...If you look on the map (in the Salute link) it is TA03. 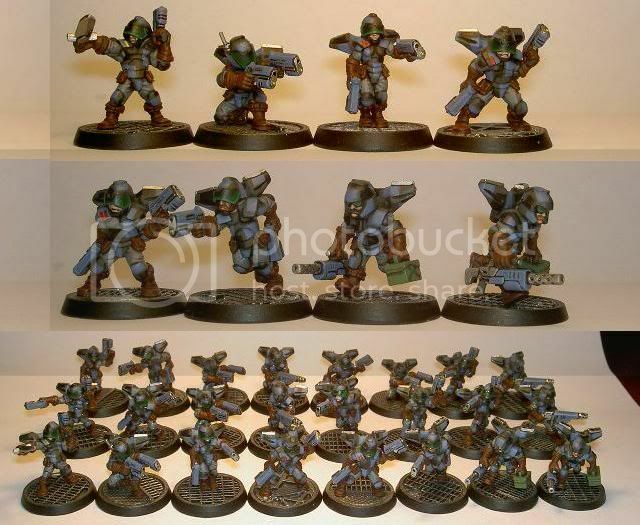 Hasslefree Miniatures (obviously): TA03: Mostly to buy Grymn...Heavy Infantry and a few Specialists. Heresy Miniatures: TA05: To see the finished dragon and also to have a look at what is on offer...Trenchcoat Gangers and Sci-fi troopers are of main interest. Twilight Miniatures: TB01: All excellent stuff but I generally look at this range for conversion potential...there are new 'alien' cavalry and pack animals that are of main interest...that and to chat to Mike and Allan on the stand...I am also looking forward to seeing the finished terrain board with the laser etched buildings from Brandlin. Studio Mcvey: TG03: They have a bunch of sci-fi troops for their 'Sedition' range that I quite like the look of. Ground Zero Games: TJ15: To look at the 15mm vehicles to see what can be turned to Grymn advantage. Antenociti's Workshop: TH08: There is just too much resin goodness to walk past. Some of the new vehicles are absolutely stunning and Dwartist has been doing a fantastic job of painting/converting them too. Wayland Games: TH09: All I need to say here is...all sorts of war-gaming stuff, cheap. Artemis Black: TC03: Another discount shop with all sorts of different ranges...definitely worth a look. Critical Mass Games: TA26: A manufacturer of the finest 15mm sci-fi miniatures you can buy...bar none. Crisply cast, expertly designed and a wide variety of troops and vehicles. The Arc fleet Walkers are awesome. Otherworld Miniatures: TA08: Some lovely fantasy monsters. Westwind Productions: TB08: Secrets of the Third Reich vehicles and miniatures. Pulp City: TM06: Superhero miniatures and they also have Maxi-Mini on the same stand...resin doo-dads and miniatures. Black Hat Miniatures: TK19: Superheroes, sci-fi and a new release of an old favourite: Cobalt sci-fi. There are others that I am likely to visit but the main ones are above. As well as visiting the traders, I will be having a look over the various gaming tables, enjoying the entertainment provided by the historical re-enactors (and the various people dressed up in costumes...always worth a laugh! ), marvelling at the paint-jobs in the painting contest, chatting to the many visitors to the Hasslefree stand and hopefully getting to have a cup of coffee with a few mates (when I can find a few minutes!). If you are going, I will be identified by my 'INSO' name-tag over at the HF stand. Come and say hello if you see me :). I am really looking forward to my day in an alternate reality. See you at the old smoke! It is Sunday and seeing as I am back home, it makes sense to pick up where I left off and post a Sunday update. I guess I was just glad to be painting again! Now that the (second) purple squad is finished, I have been converting up the next squad...a close combat squad. So far, I have cleaned them all up and glued the replacement heads on. Once the Green Stuff on the bases has dried, I will be filling in all the gaps between head and body, ready for the 'hump' to be sculpted on their backs. To be honest, I had forgotten just how time consuming these are to convert but I guess the effort is worth it in the end :) . So...the Tunnel Fighter army...how's it going and where is it going? The Urban Army project started a while ago with my jump-pack troops. I quickly learned that the camouflage was a complete wotsit to paint so I plan to paint the rest of the ground troops in a more simple grey scheme . I may even add battle damage to them...it depends on how I feel. The troops themselves, will be unconverted light infantry with helmets (like these) so that I can quickly assemble units for painting without having to convert every miniature like the Tunnel Fighters...I think it will be refreshing NOT to have to convert everything...give me a bit of a rest and maybe enable me to do a bit of sculpting...who knows? 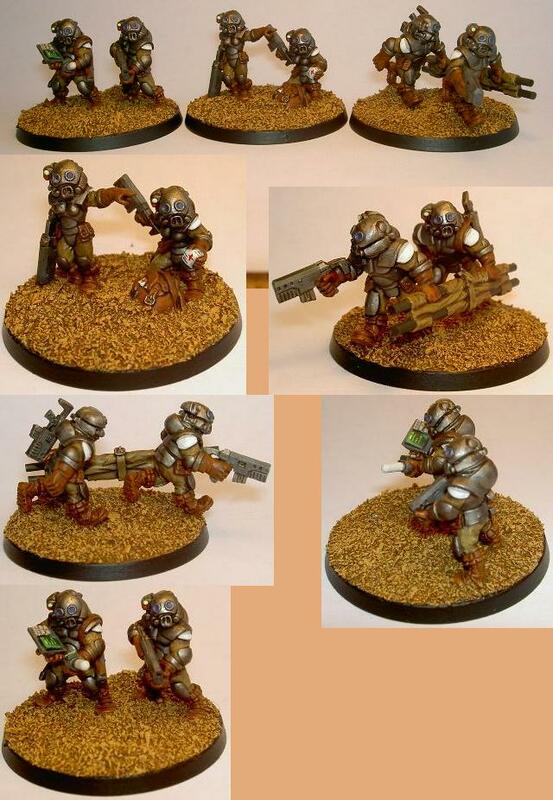 These are some extremely interesting new Space Dwarf miniatures by Pega Minidesign and they are called Ulkans. They are, to be blunt...lovely and I would love to own a load of them...maybe I will once they get a few more in the shop. Since I saw them I have had an idea of an alien race that is short and stocky...so maybe I'll knock some up and see where the muse takes me. That is the lot for now. See you over a steaming cup of rosy lee! The same can be said about a small idea. The Humble (Mechanised) Infantry Platoon. Each of the troops have a comms set-up inside his helmet for battlefield comms. The Command comms has greater range for calling in fire-support/artillery. The Command and Support sections will be carried in their individual Slingshot IFV (each section of four troops gets its own transport vehicle) with the infantry sections having Glaive APC vehicles (one provided to carry all eight troops in the section). 1x Support Platoon - may well be my airborne troops, in Dropships. I still have to nail down the other platoon/section organisation...but I will focus on getting each of the platoons finished before I worry too much about that. 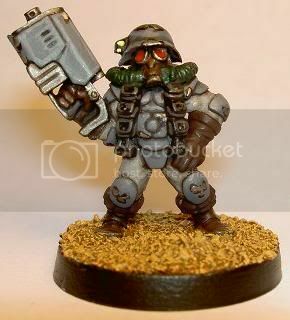 ...speaking of Clanker units...I have been looking on E-Bay and have been astounded by the price that a box of three Bauhaus Vulkan battlesuits have fetched...£72-00 + postage!!! ...It almost seems a shame to be chopping them up and converting them, doesn't it :D ! It is great to be back at home :D .
See you across the freshly mown lawns of an English stately manor. I am sitting at home, in England, with a cup of tea, as I type this post. I have returned from Kenya today and have had an epic 30 hour journey so I am extremely tired. I can safely say that the detachment went extremely well...even with the aircraft breaking so often, we still managed to complete the required amount of flying and accomplished an excellent level of support for our army colleagues...so all the heartache was worth it. I have had a good soak in the tub and am making the most of good old PG Tips tea! Tomorrow, I'll be worrying about unpacking properly...tonight I am just chilling out. ...Speaking of Salute...less than two weeks to go! I can't wait :) . See you across English fields; breathing English air under an English sky! ...It is good to be home.